As part of my job teaching journalism, I often browse entry-level reporter job ads to get a sense of the skills employers want. The descriptions of the ideal candidate in such ads are pretty good predictors of what new reporters will be expected to do. The [Milo] Yiannopoulos event … turned out to be just the kind of scenario I had hoped students would encounter. One thing the ads usually don’t say is that once on the job, new reporters might be expected to use all of these skills simultaneously on a single assignment. That means journalism students need training beyond the basics of just covering breaking news for tomorrow’s paper or the next website update. They need to know how to do so in near real time using social media and in some cases mobile and social video. So how can journalism educators start acquainting students with newer ways to cover news? For several years, I have assigned breaking news to students in my 200- and 300-level reporting classes. After a few lectures on the fundamentals of writing in a rush, students choose a real event such as a meeting or speech and turn a story within two days. This has worked well, and deadline-drive exercises have been the assignments that students said taught them the most. But this work seemed separate from the knowledge I wanted students to have about the professional and timely use of social media to deliver news. So for my 300-level students, I recently added a social media component to their breaking news assignment. The assignment calls for them to choose a newsworthy event and to write about it within 48 hours. Along the way, they must use social media (usually Twitter, but they have a choice) at least five times. They also are required to use a class hashtag, which is an easy way for me to keep track of (and offer feedback on) what they post. To prepare for the social media component, we spend about 10 minutes a day looking at how news organizations use Twitter in their reporting, and how students might use the platform to find story ideas. As part of a separate graded social media presence assignment, students also must post three tweets a week related to journalism or journalism education. This gives them an introduction to Twitter and a warm up on how it works. A few weeks into the semester, the 300-level students practice live tweeting by watching a YouTube speech and crafting tweets in a Google Doc, without publishing them. I instruct them to think of the tweets as the key points they’ll use in a story, and to use hashtags and usernames whenever possible. We also talk increasing audience engagement by adding media to tweets in addition to text. Writing the tweets without publishing them gives me time to offer feedback on their general approach, and it serves as a place to reiterate the importance of using social media responsibly. While the in-class work was valuable, student Isaac De Luna, who recently covered several local immigration-related events, said the real-world work helped boost his skills. “Having the ability to actually go out and experience what is necessary to make a breaking news happen is an invaluable lesson for any young journalist. I definitely believe theory will give the right basis for any journalist on any situation on how to cover a story, but only practice can allow a student to grow and put the learned knowledge into practice,” he said. For student Skylar Griego, having to use social media during an event made her realize she’d like to have more hands to help with tweeting on her phone while taking notes and and running a recorder. Griego, who covered a panel discussion on open records, said she saw big differences between in-class practice and real life reporting. “The most notable difference in practice live tweeting in class and doing it at an event was the pacing. In class, we practiced tweeting from a video, which we were able to pause and rewind. Or we would live tweet a guest lecturer, who would see us typing and pause at times to give us time to tweet,” Griego said. “At an event, no one slows down or pauses any longer than necessary — some don’t even pause at all. There is no rewind, (sometimes) no asking to repeat that last sentence, and no fixing tweets,” she said. In my 200-level course, students undertake similar practice with an in-class, on-deadline exercise where they watch a speech on YouTube and have to write a short hard news story on the spot. They also are assigned to select and cover a real event during the semester. For them, the social media component is optional, but highly encouraged. Usually, when I go over this assignment at the start of the semester, students fret about finding the right type of event. Using common news values as a guide, we work to identify newsworthy events that merit local coverage. 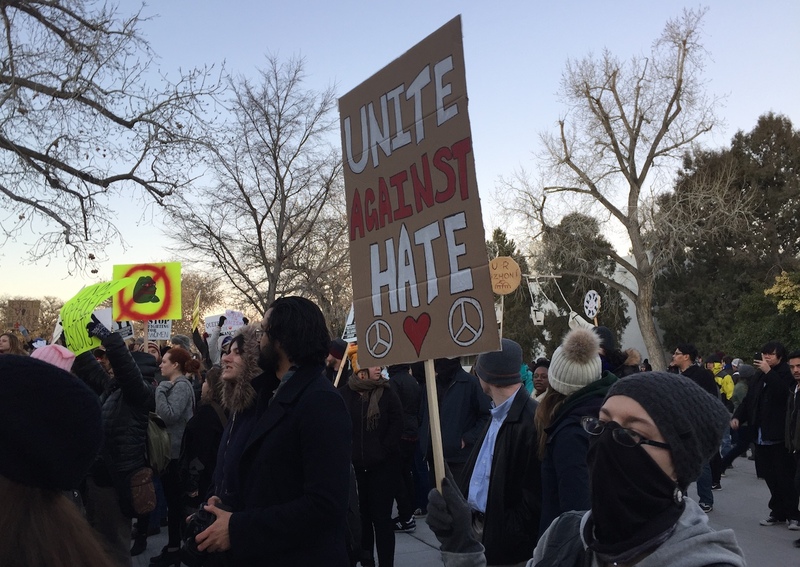 This semester we had easy pickings, with a campus visit early on from Milo Yiannopoulos, local protests against the Dakota Access Pipeline and other politically-themed events. Students also chose scheduled events such as speeches and meetings, but still had to meet the 48-hour deadline. The Yiannopoulos event came first, and I strongly encouraged students to attend. It turned out to be just the kind of scenario I had hoped students would encounter. The controversial nature of Yiannopoulos’ speech meant hundreds of students were present, mostly to protest. The multi-agency police presence was large, and students faced the issue of having to secure access into the event. A small handful of students were able to enter the speech, while others were left outside to cover the protests — a breakdown of duties that mimics how real news organizations at the scene broke up the work. By and large, students did well handling the experience, which became chaotic and included arrests as the night wore on. Some students said they worked to overcome their nervousness at the unrest as they covered the event while others dealt with technological issues. Student Jazzy Zama said she learned several valuable lessons on the scene. “Covering this speech taught me to be on my guard because anything can happen, whether it was to look out for my safety or to watch what was happening amongst the people and get good footage. I learned to have my equipment ready before getting on the scene and to have multiple SD cards in case anything happened,” she said. “It was helpful that my phone was fully charged because my Zoom (audio recorder) ended up not working for my interviews and soundbites, so I had to record the information on my phone. I realized it was important to have the camera batteries charged and the camera constantly rolling so I didn’t miss something (Yiannopoulos) said or an audience member said,” Zama added. Student Sarah East said covering the event gave her a sense of what to do the next time she covers breaking news. Kate Nash Cunningham teaches journalism at the University of New Mexico. Follow her @katenashnm.